While the West was applying pressure on Iran to abandon its civilian nuclear programme, the Saudis were buying the atomic bomb from Israel or Pakistan. 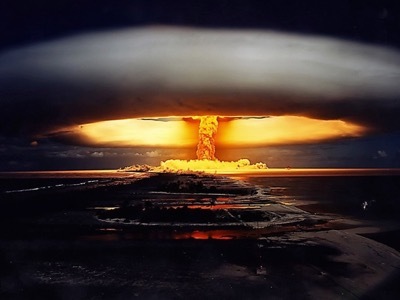 From now on, to everyone’s surprise, the Near East has become a nuclear zone, dominated by Israel and Saudi Arabia. In 1979, Israel completed the final adjustments to its atomic bomb, in collaboration with the apartheid régime of South Africa. The Hebrew state has never signed the Non-Proliferation Treaty, and has always avoided answering questions about its nuclear programme. Every year since 1980, the United Nations General Assembly has adopted a consensual resolution to make the Near East a region free from all nuclear weapon. This resolution was aimed at encouraging Israel to give up its bomb and to ensure that other states would not enter into an arms race. Under the Shah, Iran also had a military nuclear programme, but it was pursued only marginally after the revolution of 1979, because of the war started by Iraq (1980-88). However, it was only after the end of war that ayatollah Rouhollah Khomeini opposed weapons of mass destruction, and consequently prohibited the fabrication, possession and the use of atomic weapons. Negotiations then began for the restitution of the 1,180 billion dollars of Iranian investment in the Eurodif complex for the enrichment of uranium at Tricastin. However, the question was never resolved. As a result, during the dissolution of Eurodif in 2010, the Islamic Republic of Iran still owned 10% of the capital. It is probable that it still holds a part of the company for uranium enrichment at Tricastin. From 2003 to 2005, the negotiations relative to the nuclear litigation were presided for Iran by Sheikh Hassan Rohani, a religious leader close to Presidents Rafsandjani and Khatami. The Europeans demanded the introduction of a passage stipulating that Iran dismantle its system for the teaching of nuclear physics, so as to ensure that they would be unable to relaunch their military programme. However, when Mahmoud Ahmadinejad – a partisan for the relaunching of the Khomeinist Revolution – came to power, he rejected the agreement negotiated by Sheikh Rohani and dismissed him. He restarted the teaching of nuclear physics, and launched a research programme which was aimed, in particular, at finding a way of producing electricity from atomic fusion and not nuclear fission, which is currently used by the United States, Russia, France, China and Japan. Accusing President Ahmadinejad of «preparing the Apocalypse to hasten the return of the Mahdi» (sic), Israël launched an international Press campaign intended to isolate Iran. In reality, Mahmoud Ahmadinejad does not share the Jewish vision of an evil world which has to be destroyed and then rebuilt, but that of a progressive maturation of collective awareness until Parousia, the return of the Mahdi and the prophets. At the same time, Mossad busied itself with the assassination, one by one, of a number of Iranian nuclear scientists. From their side, the Western powers and the UN Security Council adopted ever more restrictive sanctions until they had completely isolated Iran at the economic and financial level. In 2013, the Guide of the Revolution, ayatollah Ali Khameinei, agreed to a round of secret discussions with Washington, in Oman. Persuaded that he had to loosen the constraints which were suffocating his country, he considered a provisional ten-year agreement. After a preliminary agreement, Ahmadinejad’s candidacy for the Presidential election was not authorised, and Sheikh Hassan Rohani was elected. He restarted the negotiations that he had abandoned in 2005, and accepted the Western conditions, including the ban on enriching uranium at 20%, which put an end to the research on nuclear fusion. In November 2013, Saudi Arabia organised a secret summit which brought together members of the Gulf Cooperation Council and the friendly Muslim states . In the presence of delegates from the UN General Secretariat, Israeli President Shimon Peres joined them by video-conference. The participants concluded that the danger was not the Israeli bomb, but the bomb that Iran might one day possess. The Saudis assured their interlocutors that they would take the necessary initiatives. Military cooperation between Israel and Saudi Arabia is a new phenomenon, but the two countries have been working together since 2008, when Riyadh financed Israel’s punitive expedition in Gaza, known as «Operation Cast Lead» . The 5+1 agreement was not made public until mid-2015. During the negotiations, Saudi Arabia multiplied its declarations that it would launch an arms race if the international community did not manage to force Iran to dismantle its nuclear programme . On the 6th February 2015, President Obama published his new «National Security Strategy». He wrote – «Long-term stability [in the Middle East and North Africa] requires more than the use and presence of US military forces. It demands partners who are capable of defending themselves by themselves. This is why we invest in the capacity of Israel, Jordan and our Gulf partners to discourage aggression, while maintaining our unwavering support for the security of Israel, including the continued improvement of its military capacities» . On the 25th March 2015, Saudi Arabia began its operation «Decisive Tempest» in Yemen, officially aimed at re-instating the Yemeni President, who had been overthrown by a popular revolution. In fact, the operation was the implementation of the secret agreement between Israel and Saudi Arabia for the exploitation of the Rub’al-Khali oil fields . On the 26th March 2015, Adel Al-Jubeir, then the Saudi ambassador to the United States, refused to answer a question from CNN concerning the project for a Saudi atomic bomb. On the 30th March 2015, a joint military Staff was set up by Israel in Somaliland, a non-recognised state. From the first day, Saudi Arabia, Egypt, the United Arab Emirates, Jordan, Morocco and Sudan participated under Israel command. Two days later, on the 1st April 2015, during the Charm el-Cheick summit, the Arab League adopted the principle of a «Joint Arab Force» . Officially, this was to implement the Arab Defence Treaty of 1950 to fight against terrorism. De facto, the League had validated the new Arab military alliance under Israeli command. In May 2015, the Joint Arab Force, under Israeli command, used a tactical atomic bomb in Yemen. It may have been used in an attempt to penetrate an underground bunker. On the 16th July 2015, intelligence specialist Duane Clarridge affirmed on Fox Business that Saudi Arabia had bought the atomic bomb from Pakistan. On the 18th January 2016, Secretary of State John Kerry affirmed on CNN that atomic weaponry can not be bought and transferred. He warned Saudi Arabia that this would constitute a violation of the Non-Proliferation Treaty. On the 15th February 2016, Saudi analyst Dahham Al-’Anzi affirmed in Arabic on Russia Today that his country has been in possession of an atomic weapon for two years, in order to protect Arabs, and that the major powers know this. The declarations of Saudi analyst Dahham Al-’Anzi, on the 15th February 2016 on Russia Today – which were immediately translated and broadcast by the Israeli service Memri – raised a considerable echo in the Arab world. However, no international political leader, not even Saudi, made any comment. And Russia Today has erased them from its Internet site. The declarations of Dahham Al-’Anzi – an intellectual close to Prince Mohamed ben Salman – lead us to think that he was not speaking of a strategic atomic weapon (A-bomb or H-bomb), but a tactical bomb (N-bomb). Indeed, it’s difficult to imagine how Saudi Arabia could «protect Arabs» from the Syrian «dictatorship» by using a strategic nuclear bomb. Moreover, this corresponds to what has already been observed in Yemen. However, nothing is certain. It is obviously unlikely that Saudi Arabia had built this kind of weapon itself, since it is absolutely bereft of scientific knowledge in the matter. On the other hand, it is possible that it bought the weapon from a state which has not signed the NPT, Israel or Pakistan. If we are to believe Duane Clarridge, it would have been Islamabad which sold its technology, but in this case, the weapon could not be a neutron bomb. Since Saudi Arabia signed the Non-Proliferation Treaty (TNP), it did not have the right acquire the weapon, whether it be a tactical or a strategic bomb. But it would be enough for King Salman to declare that he bought the bomb in his own name to avoid being concerned by the Treaty. We know that the state of Saudi Arabia is the King’s private property, and that his budget only represents a part of the royal coffers. This would mean that we have entered a phase of the privatisation of nuclear weapons – a scenario which until now had been unthinkable. This evolution must be taken most seriously. Finally, everything leads us to believe that the Saudis acted within the framework of US policy, but that they overstepped themselves by violating the NPT. By doing so, they have laid the foundation for a nuclearised Near East in which Iran could no longer play the role that Sheikh Rohani had hoped to recover, that of «regional police force» for the benefit of his Anglo-Saxon friends. Thierry Meyssan, French intellectual, founder and chairman of Voltaire Network and the Axis for Peace Conference. His columns specializing in international relations feature in daily newspapers and weekly magazines in Arabic, Spanish and Russian. His last two books published in English : 9/11 the Big Lie and Pentagate.